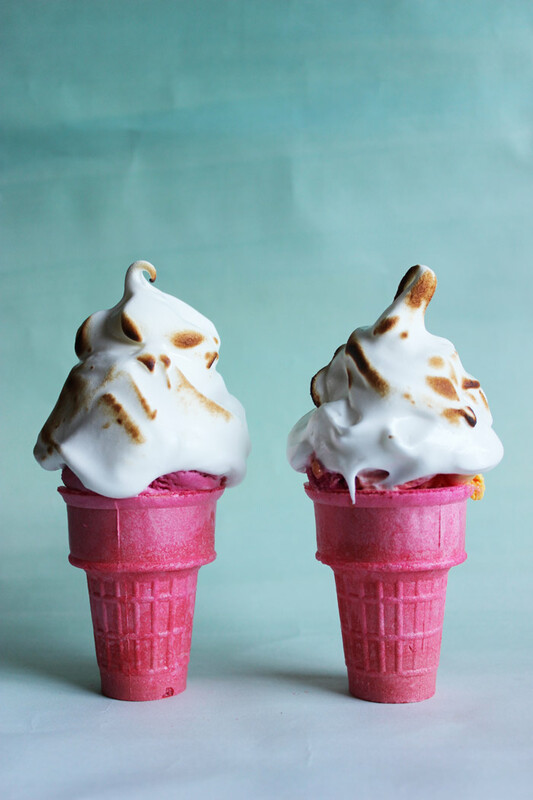 I made this Baked Alaska Ice Cream Cone and posted it back in Feburary and just came across the image today again. Might have to make another! 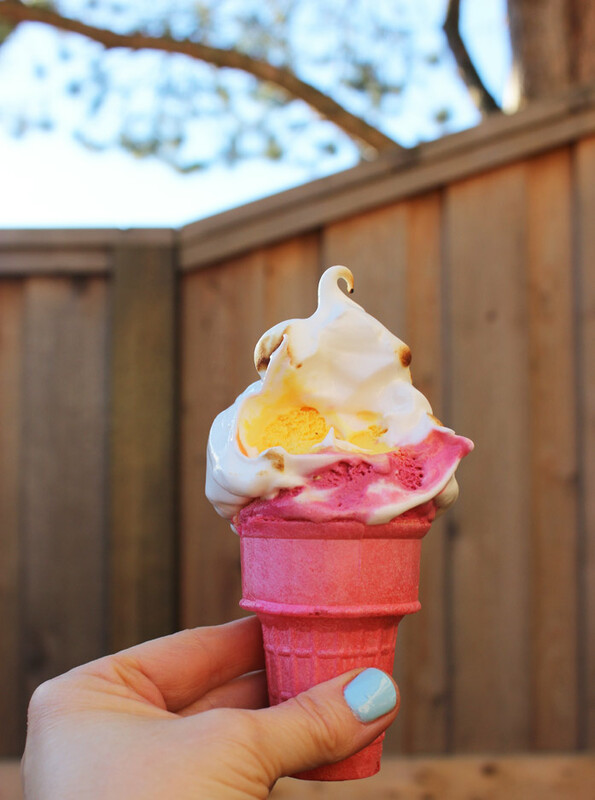 This one was so delicious, it's definitely worth a repost before summer ends! Click below for the recipe! As a young child I was always awe-inspired with my Aunt Vi's Baked Alaska. This was in the day before chef's torches were a common household tool and she somehow managed to pull it off using the broiler in her oven. It was always exciting to see it arrive at the table, and even more fun to devour! I've always wanted to attempt such a feat, but have always been terrified of the larger version. But making smaller individual ones is so less daunting, in fact, quite fun. So I thought it would be fun to make an ice cream cone version. Makes for a fun and special treat for Valentine's Day! 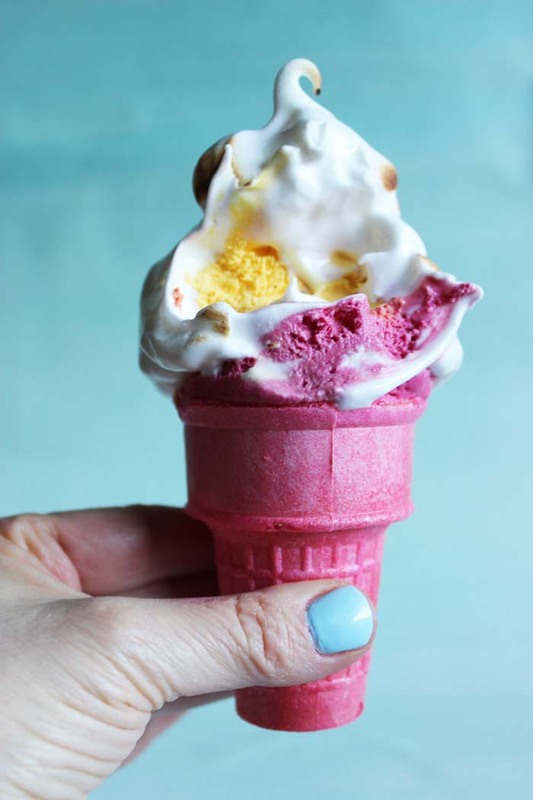 two scoops of your favourite ice cream (the more colourful, the better the surprise when you bite it)! 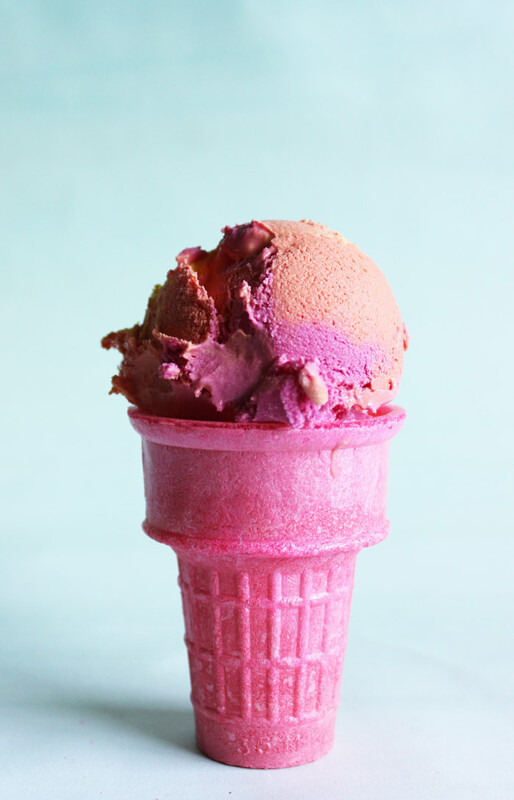 To start, place the mini cupcakes (icing removed) into each of the small ice cream cones or cups. Then top each with a scoop of ice cream. Place into the freezer so that the ice cream gets really hard. (I used a muffin tin to store them in to keep them from toppling over). 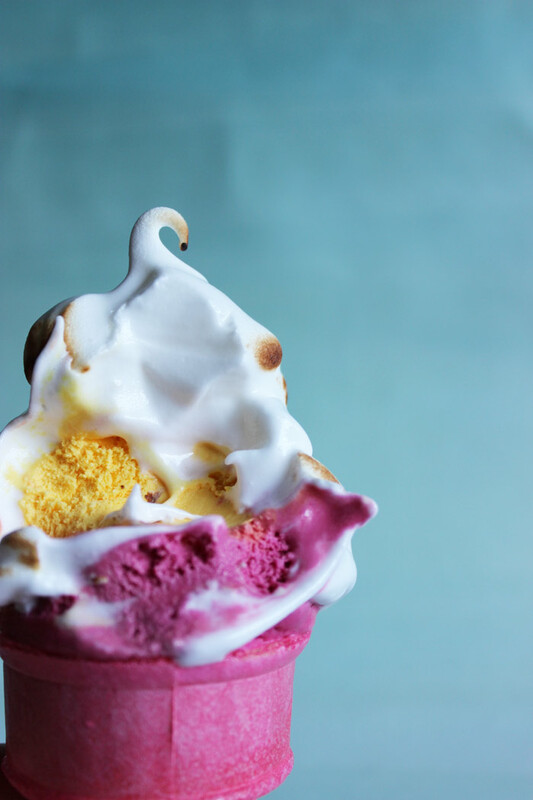 In the meantime, make the meringue (the Swiss meringue method using a bain-marie). In a tall glass bowl add the egg whites and whisk in the sugar, cream of tartar and salt. Place the bowl over a pot of hot simmering water on the stove (bain marie) and stir to heat up the egg whites until they are warm/hot (but not boiling). Once heated, remove the bowl from the pot and whip with an electric mixer until the whites form stiff shiny peaks. 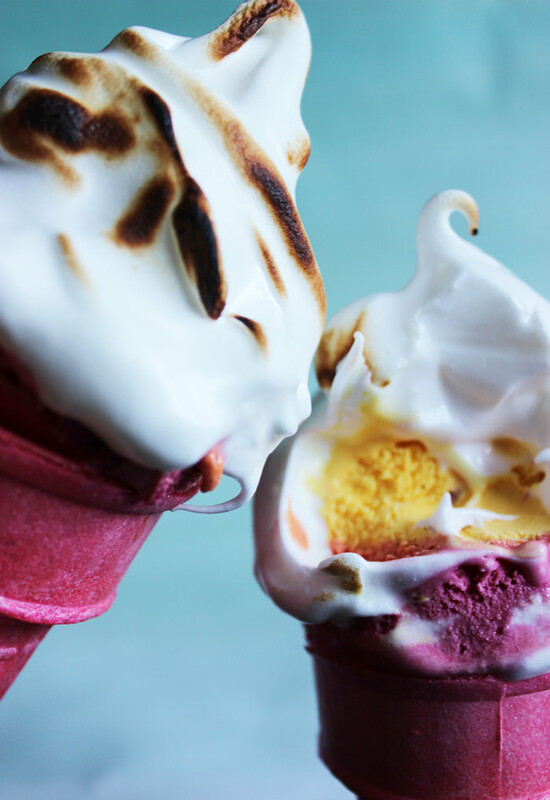 Pull the ice cream cones out of the freezer (one at a time) and start to ice each one with the meringue. After it has been iced, brown the meringue using a chef's torch being careful not to torch the cone. Set the meringe topped cone back into the freezer until ready to serve. Continue on with the next cone until all are cones are ready. Pull out of the freezer when the last one has been prepared, and serve immediately! Enjoy! Someone said the one on the left looked like Jabba the Hut! These are so cute! Love that they're personal sized ... Perfect for this long weekend!